Theresa May once posed in a t-shirt which read ‘This is what a feminist looks like’. In 2006 the Fawcett Society, a British organisation which campaigns for women’s rights, posted onto their flickr page a selection of images of prominent members of UK society wearing their t-shirts. Mrs May does not look completely comfortable in the image, but as the image does not look professional we could excuse her for that. In her favour she does appear to champion women in politics, she has introduced some laws that benefit women (including extending domestic violence protections), and she is, after all, a female prime minister. However, she has a dodgy record of voting for LGBT rights and her attitudes towards immigration and austerity have left women much worse off. To cap it all, there’s the comments she made on the One Show last night. The One Show is a weekday magazine show broadcast live on BBC One directly following the 6 o’clock News. Mrs May’s camp has said that during this General Election campaign she will be making a limited number of television appearances, but last night’s interview was one of the few exceptions. Sitting on the show’s green sofa alongside her husband Philip, this was an attempt to ‘humanise’ Theresa May, to make her more ‘approachable’ to voters. For some, that may have been the case. She wasn’t told about the questions beforehand, but she also wasn’t asked anything particularly difficult. There was nothing she could slip up on and, unfortunately, no rebellious grilling from Matt Baker, who infamously asked David Cameron how on earth he slept at night in 2011. 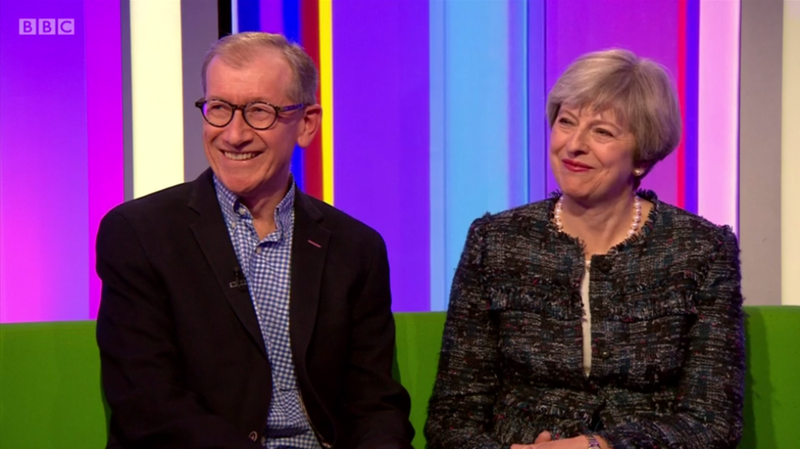 Before getting into what was really troubling about Mrs May’s interview, I just want to pause and think about how she decided to try and reach ordinary people by making a tv appearance with her husband. Philip May is not a politician. He does not, as far as I can tell, have any form of public role at all and instead works in finance. He may be married to the current prime minister, but why does that mean he should be interviewed? Ah yes, because the way to ‘humanise’ a powerful woman is to prove that look, she’s just like everyone else! She’s married! To a man! She must be manageable. The fact that he mostly sat turned slightly towards her, nodding in agreement with her, should just show how loveable she is. But doesn’t it just reinforce the notion that a woman is only important if she has the affections of a man? Trying to find out more about her home life instead of asking her about her policies is an attempt to show that being a powerful woman doesn’t diminish her ‘womanliness’. He said she was a good cook, but did make the concession that the sort of man who would expect to come home to his dinner on the table at six every evening would not enjoy being married to her. But not because of her, because of her job. By mentioning that this was not a thing that happened, it implicitly suggested that it is a thing that can reasonably be expected to happen. God forbid the husband of a working woman cooks dinner for her. But the real bombshell, the statement that made me angry that Mrs May thought she could wear that t-shirt all those years ago, came quite early on. Asked how hard it is to win a negotiation with Mrs May, Mr May replied that marriages required give and take. I don’t think many would agree. He then quipped that “I get to pick when I take the bins out, not if”. So far, so innocuous. But then Mrs May jumped in, across the beginning of another question, that there was “boy jobs and girl jobs.” I’ll let that sink in. Boy jobs and girl jobs. From a PM who once claimed to be a feminist. As our very own Lee wrote in a comment on Lauren’s piece about Ivanka Trump’s fake feminism, you can’t just call yourself a feminist. Well, you can, but that doesn’t make you one. Actions speak far louder than words and the way in which her government’s austerity measures are hitting women is frankly inexcusable. Not only that, but to go on a prime time television show watched by millions of people and express such regressive opinions is hardly the way to inspire and encourage young women. Mrs May has the biggest ‘boys job’ of them all and yet she isn’t showing herself to truly believe the words on that t-shirt. Theresa, I’m a bit disappointed.